She was the youngest daughter of Frank and Helen Ujlaky. A beautiful baby girl, she was baptized Etelka on March 21, 1920 at the age of one month. A first generation American born of parents who had emigrated from Hungary, she came to be known as Ethel. 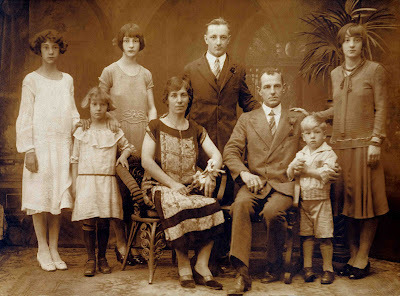 Two years later Ethel's younger brother Kasmir was born into the family: the last of the six Ujlaky siblings. Staten Island, New York, circa 1926.
at left of her mother (seated). Born between their two brothers in this closeknit family, the four sisters, who entered the family within the span of a decade, developed a special sisterly bond that grew throughout the years. Here they are together in 1936 outside the family's South Beach, Staten Island home. 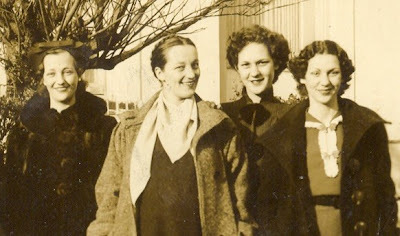 Ethel, third from the left, is sixteen years old. Her sisters, all in their twenties, were making their way into adulthood, getting married and having children of their own. The Ujlaky sisters, circa 1936. Ethel is the third from left. Sadly, when Ethel reached her twenties, tragedy struck. Suffering from tuberculosis, she was admitted to Sea View Hospital on Staten Island. Ethel died in 1943, about a month shy of her twenty-third birthday. Knowing the love that her sisters share, I was deeply touched when I learned the story of their beloved younger sister Ethel. They, her brothers, and her parents suffered a deep loss when she left them at such an early age. And you just had to leave your kin. And the memory of you Ethel will live on and on. Rest in peace, "dear sister Ethel". For more on Ethel Ujlaky's story, including a picture of her bronzed baby shoe, see The footprint of little Ethel. For more about the Ujlaky family's home on South Beach, Staten Island, see "The Waves' Rippling Song": South Beach, Staten Island. For more mystery photographs visit the 11th Edition of footnoteMaven's Smile For The Camera Carnival whose theme is "Brothers & Sisters". 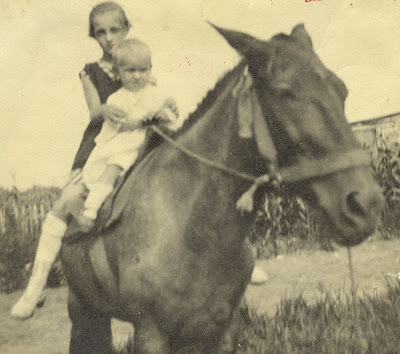 Ujlaky sisters with Buster the horse, Staten Island, New York. Sepia photographic print. Circa 1921. Privately held by Lisa, [address for private use]. 2009. Ujlaky family, Staten Island, New York. Sepia photographic print. Circa 1926. Privately held by Lisa, [address for private use]. 2009. Ujlaky sisters, Staten Island, New York. Sepia photographic print. Circa 1936. Privately held by Lisa, [address for private use]. 2009. Awww, beautiful poem! And I'm really enjoying all the lovely old pictures. Thank you for them.